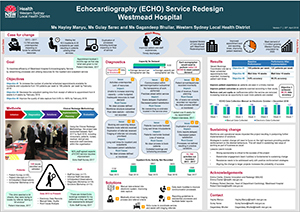 This project aimed to optimise the efficiency and sustainability of the Echocardiography (ECHO) Clinic at Westmead Hospital, by streamlining processes, distributing resources efficiently and delivering better services to the Western Sydney community, ahead of the opening of the new acute services building in 2020. To increase the number of inpatient and outpatient appointments available from 155 patients to 186 patients per week by February 2018. To reduce the time between receiving the outpatient referral and confirming the appointment, from six weeks to four weeks by February 2018. To increase the amount of patient activity data captured from 9.6 per cent to more than 90 per cent by February 2018. Improves patient access to ECHO Clinic. Enhances collaboration and communication with the ECHO team and other stakeholders, including medical and nursing teams. Reduces turnaround time for inpatients awaiting discharge pending echocardiogram results. Streamlines processes and improves coordination of patient care. Improves communication and staff knowledge of escalation processes. Supports new medical staff and defines their roles and responsibilities during clinic rotations. Increases the accuracy of data entered and potential revenue generation. The ECHO Clinic at Westmead Hospital is the primary provider of public inpatient and outpatient echocardiograms for people in Western Sydney. There is a growing demand for this service, with the number of patients increasing by 36 per cent per year. In addition, population growth for Western Sydney is projected to reach nearly 1.3 million by 2021.1 To meet the needs of a fast-growing population, Westmead Hospital is undertaking a redevelopment, including a new acute services building expected to open in 2020. Prior to the project, the ECHO Clinic at Westmead Hospital was struggling to meet the needs of patients. An audit showed that 13,780 occasions of service were not recorded between January 2013 and May 2017 (Table 1), which impacted the sustainability of the Clinic, as well as its ability to justify additional funding. 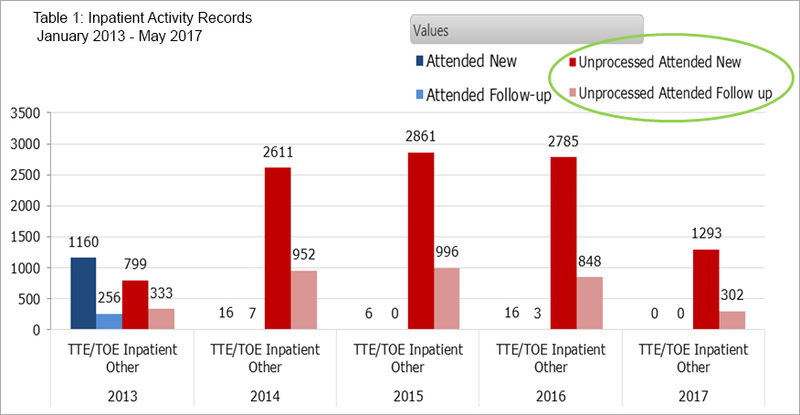 A patient survey conducted in May 2017 also identified that an average of 31 patients every week were unable to have echocardiograms due to resource shortages, with approximately 80 outpatients each month facing wait times of between one and three months. a lack of formal triaging guidelines in place for referrals to the ECHO Clinic. The transformation of Westmead Hospital was an ideal opportunity to improve the efficiency of the ECHO Clinic, by developing a model of care that aligned with the Triple Aim principles: improving the patient experience; improving the health of populations; and reducing the per capita cost of health care. Lock out times for the Cerner program were extended from five minutes to one hour, allowing the administration clerk access to inpatient referrals faster and reduce the need to log back in. Using a shared printer between multiple services led to an unnecessary amount of labels printed, as well as time wasted trying to filter through other printed materials. A dedicated patient label machine was purchased to reduce the time, cost and waste of printing unnecessary labels. Previously, one phone was shared between three staff members sharing the office. A designated phone and bookings area was created, to give staff the space and resources needed to take bookings more effectively. Patients had described appointment letters as confusing, so the letter was revised to ensure information such as location and pre-scanning instructions was clear to patients, families and carers. Roles and responsibilities of key staff in the ECHO Clinic were reviewed, with changes made to create accountability and improve efficiency. The designated medical officer prioritised referrals according to clinical need, allowing the bookings clerk to complete bookings efficiently. The following solutions will be implemented once recruitment for staff in the ECHO Clinic is complete. New criteria guidelines will be developed with four triage categories to help medical officers and sonographers better prioritise patients. Recruitment of a dedicated nurse to triage referrals in the absence of the medical officer will be undertaken. This role will also organise inpatient transfers to and from the ECHO Clinic and help with patient care. Laptops for sonographers will be acquired, to enter preliminary ECHO reports directly into the database. This will eliminate the need to enter data manually and allow medical officers to adjust patient treatment plans accordingly. Streamlining reporting guidelines and associated key performance indicators will be undertaken, to improve the flow of the Clinic and support quality improvement activities. It will also allow the Clinic to scan more patients and reduce patient wait times. Due to changes to the ECHO Clinic workforce, implementation of solutions are still continuing. More than 90 percent of patient activity data was recorded between October 2017 and December 2017, achieving the aim of the project. 1045 occasions of service were recorded between October 2017 and December 2017, with less than one percent discrepancy between manual and electronic data analysis. Daily huddles were recorded between September 2017 and February 2018. 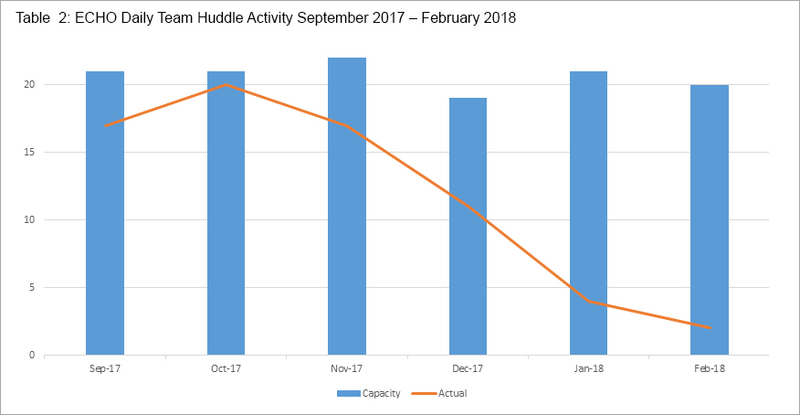 The number of huddles declined from January 2018 due to staff changes in the ECHO Clinic, with four huddles held in January 2018 and two in February 2018 (Table 2). The number of patients having an ECHO decreased from a baseline of 155 patients per week to 131 patients per week as of February 2018 (Objective 1 not achieved). Outpatient waiting times increased from greater than six weeks to greater than eight weeks as of February 2018 (Objective 2 not achieved). Data capture increased from a baseline of 9.6 percent accuracy to 99.3 percent accuracy as of February 2018 (Objective 3 achieved). Strong sponsorship is critical to the success of the project. Resistance needs to be addressed early with positive reinforcing behaviours. Implementing one solution at a time contributes to sustained change. Staff engagement and involvement is imperative to the success of the project. Aligning the change to larger projects increases the probability of success. Epidemiology, Executive Medical Services. WSLHD Social and Health Atlas. North Parramatta NSW: WSLHD; 2013. Yu E. Implementing a Daily Team Huddle. Chicago USA: American Medical Association; 2015. Douglas P, Garcia M, Haines D. Appropriate Use Criteria for Echocardiography. Journal of the American College of Cardiology 2011;57(9):1126-66. Neskovic A, Hagendorff A, Lancellotti P et al. Emergency echocardiography: the European Association of Cardiovascular Imaging recommendations. European Heart Journal - Cardiovascular Imaging 2013;14(1):1-11. Queensland Government. Wait Times Strategy Statewide Consultation Handbook. Queensland. Brisbane QLD: Department of Health; 2015.